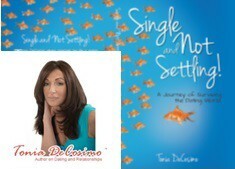 Tonia DeCosimo’s new book, Single and Not Settling: A Journey of Surviving the Dating World, a combination memoir and dating advisory manual, is witty, breezy, and informative. The book, now available in print and electronic format on Amazon.com, BarnesandNoble.com and other sites, is a narrative from the author about how she managed to survive the dangerous shoals of dating and find her own safe harbor in her forties. As the book moves along, from her upbringing on Long Island, where she lived with her family, the reader will discover how Tonia’s expectations as well as her relationships changed as she grew into a successful businesswoman. From a canceled engagement in her 20’s, through the rough and tumble dating decade of her 30’s and into her 40’s where she finally secured happiness, DeCosimo provides a roadmap of failed relationships and new directions with which many women (and men) can intimately identify. At the end of each chapter, DeCosimo provides some highly applicable tips that can help the reader determine a path towards finding the right mate, without “settling” for less than what is really desired. Even though the book is primarily focused on women, men can benefit from reading it, especially the tips, to learn the how to’s and how not’s of establishing long-term relationships. Here are a couple of random tips from the practical portions of the book. While the memoir aspects are excellent as examples of the hard lessons that Tonia DeCosimo learned, her tips are spot on and when coupled with the chapters prove to be invaluable. There are so many more valuable tips, it’s worth reading the book just to see all the detail she puts into each one of these subjects. She wants you to know that if you are single, you are not alone. Tonia DeCosimo is a successful entrepreneur from Long Island, New York. She received her B.S. degree in Elementary Education and English from Manhattan College. Tonia’s career path, however, took her into the fields of marketing, publishing and sales consulting in which she has worked successfully for the past 25 years. Tonia publishes a directory of executives and professionals and specializes in assisting them with networking, increasing their exposure and expanding their market reach among other achievements. Currently Tonia writes for Zoosk’s popular magazine, The Date Mix, where she provides tips and advice on dating for the over 40 set, with solid advice and anecdotes. She is also on Twitter and Facebook offering her unique take.